All Things October - All Things Special Ed. Happy October! Can you believe it is already fall? I am loving the cooler weather, but I do miss the longer days with the sun. Now that it is October, I was in need of some fall/pumpkin/Halloween activities for this month. Here are some goodies you can find in my store and some fellow sped-ucators as well!! In my small groups we are working on basic sentences and also talking about what nouns are. 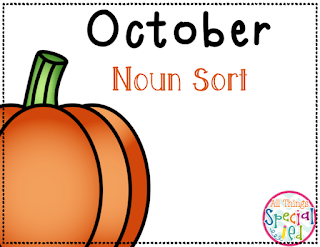 I have a new noun packet that includes sorting noun pictures and 2 versions of a worksheet. My students love taking turns sorting the big pictures into the pocket chart and helps get them up and moving. I have included an anchor chart to help those with the definition of a noun. Also there are headers (person, place, and thing) for the top of the pocket chart. 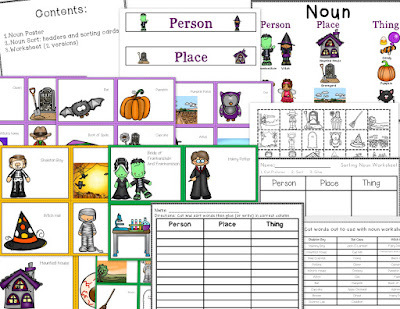 Included in this packet are 2 versions of the worksheet. One with just words and one with just pictures. They can sort the words or the pictures into the correct columns. I am also creating an October Bingo packet so be on the look out in the next few days if that is something you may be interested in using for the month of October. This is an awesome new product for math, a hands on problem solving kit! I dislike teaching problem solving because it is so hard for the students. I started this today and it went super! 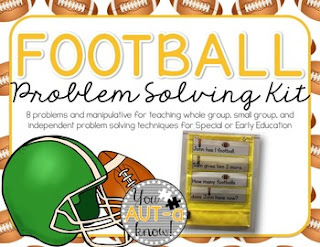 The packet comes with lots of visuals and manipulatives to act out the problem solving question (that you display in a pocket chart) in small/whole group. 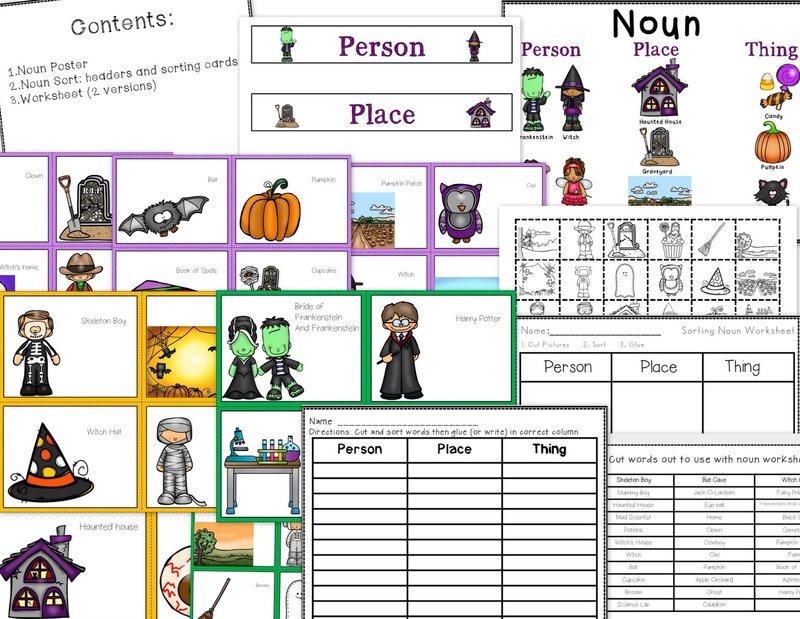 It also comes with a set of worksheets that students can practice on their own or with more guided help with the teacher. Thank you You Aut-a-know for this wonderful set to help teach problem solving! I absolutely love it! Also she just posted a soccer version as well- stop by her store today! Link in picture above. 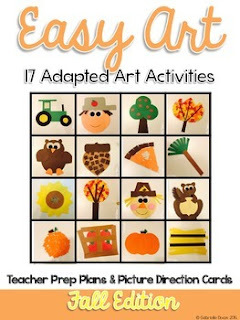 To add some fun into our week and work on fine and visual motor skills, I use Teaching Special Thinkers Fall Easy Art activity packet. We just finished up one of the pumpkins and we have it proudly displayed outside my classroom on the bulletin board and will be adding more each week! 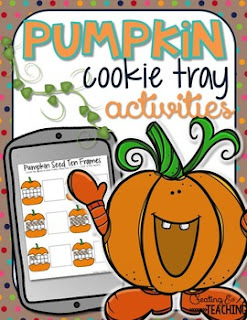 And lastly, another fun activity that I have included for students to work independently on or with a para is this Pumpkin Cookie Tray Activities (she also has an apples version) from Creating and Teaching. Super cute, super fun - you won't be disappointed!! 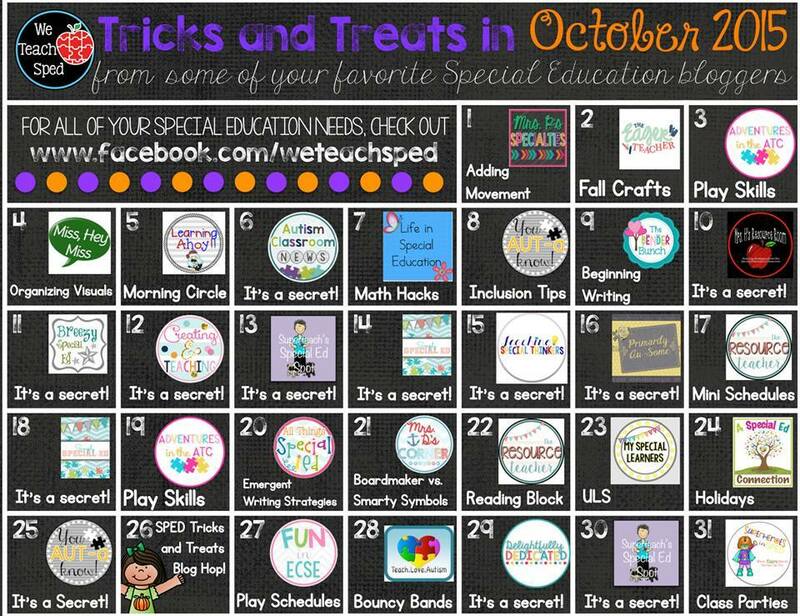 And don't forget at the end of the month those of us that contribute to We Teach Sped will be hosting a SPED Tricks and Treats blog hop so be on the look out for some fun! 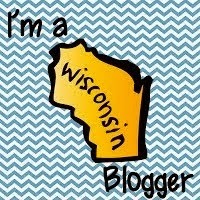 And as always we will be having some great bloggers talk about various topics throughout the month!